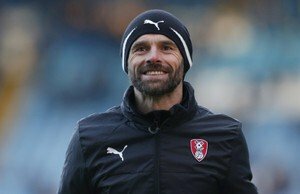 Rotherham United Manager Paul Warne told Radio Sheffield that the fact that he’d led the Millers to Wembley hadn’t quite sunk in. Speaking straight after the final whistle last night the Millers Boss said, ‘It’s a bit surreal. It’s not sunk in yet. ‘The atmosphere was electric tonight. I don’t think we started very well, we were playing the occasion and not the game but did create enough chances to win the game. ‘The Chairman told me that we don’t use Will Vaulks’ long throw enough so he’ll take massive credit for the first goal and it was a good time to score right on half-time. I thought we played a lot better second half and could have had more goals. ‘I thought the Scunny players were excellent and, if I’m honest, I thought Marek (Rodak) pulled us out of the clunk a few times and made some great saves, though, in fairness that’s what he’s there for. He was excellent tonight and I think the overall performance is something they can all be proud of. I feel for Dawsy (Nick Daws) whose a great coach and a great human being. ‘Ikie (Michael Ihiekwe) had a tight quad at half-time but he begged me to keep him on. I didn’t think he was moving right so put Semi (Ajayi) on and he did excellent. I think all the lads defended well and it’s epitomised by Smudge (Michael Smith) up top, it’s a lonely place up there at times and he works hard for the team with and without the ball. I knew as soon as Will Vaulks hit the ball it would be in and I’m really pleased for him. ‘Collectively they all try for each other, they all try for this team, they all try for the badge and I’m really proud of them.